Find here the review of the most common football injuries and trauma. Learn to recognize and avoid them. With 270 million registered players (4% of the world population! ), Football is certainly the most popular sport in the world. Whether practiced as an amateur or professional, it is nonetheless a very common source of trauma and is one of the most restrictive sports for the foot and ankle.Acute or chronic traumatic lesions, tendinitis, osteoarthritis, the range of attacks is vast and complex. Here is a list of the most common lesions and their treatment. Why is football so hard for the foot and ankle? Although the question is simple, the answer is no less complex. There are a multitude of specific points that add up and create favorable conditions for trauma and pain in the ankle. Just follow a match and players to understand the source of these foot injuries. Football is a sport where accelerations must be explosive, the wearing of crampons entails major constraints by blocking the foot relative to the rest of the body, hyperflexions and hyperextensions of the ankle hurt the joint, direct contact (tack, etc. ..) can be very violent ... In short, the sources of trauma are legion and any self-respecting footballer suffered, sooner or later, problems of his lower limbs. The articular conflict is defined by a mechanical blockage of a joint. The causes are numerous but one generally finds bone growths or fibrous scars on both sides of the joint. When the ankle is flexed or extended, these growths come into contact with each other, blocking the movement and causing pain (see image above). Scientific studies have shown that forced movements, for example when striking a balloon, impose a violent impact between the bones of the ankle. This leads to microlesions of the bone and bleeding (hematoma) which, although painless, end with years of calcification. It is also quite simple to recognize a young footballer only by looking at his ankle x-rays which often show the development of these growths, also called osteophytes. Ligament lesions (sprains, for example) can also cause blockage, creating a mass of fibrous tissue in the ankle. It is usually located on the lateral edge of the ankle, with a very specific painful area. Although these growths are generally asymptomatic, it is sometimes necessary to operate them in case of persistent pain or blockages. The development of ankle arthroscopy has been a real revolution in the understanding and treatment of these lesions. For more information, find our specific page on ankle conflicts. It is impossible to talk about the trauma of the footballer without looking specifically at ankle sprains . 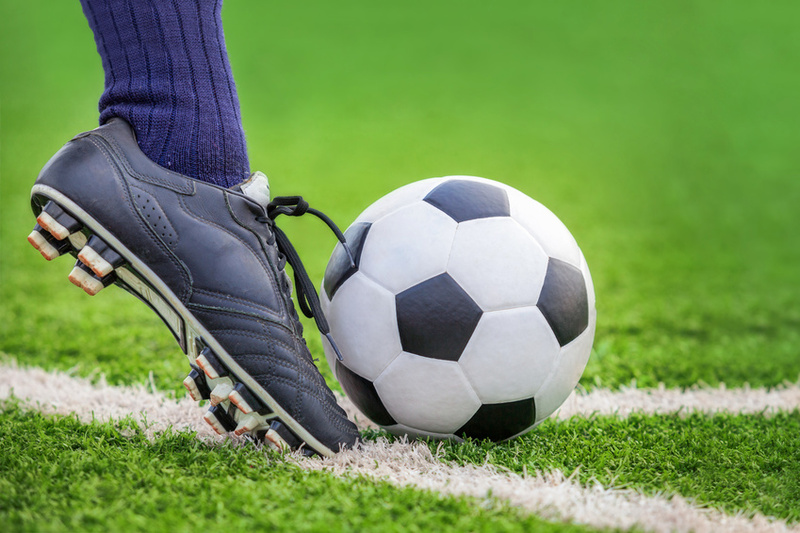 The design of football boots is clearly one of the main risk factors for ankle pain. Running with crampons is obviously mandatory on a football field, otherwise the list of trauma would certainly be twice as long! However, the specific moment when the crampons are planted in the ground is a particularly dangerous moment. At this precise moment, the foot is fixed in one position while all the rest of the body is moving. It is then enough that the movement is modified to cause extreme forces at the articular level. It is usually at this time that ligamentous lesions of the knee, ankle sprains, or fractures occur. There are other important risk factors such as a lower extremity axis defect, ligament laxity, a hollow foot, etc. Ankle sprain is an injury to the ligaments stabilizing the bones. 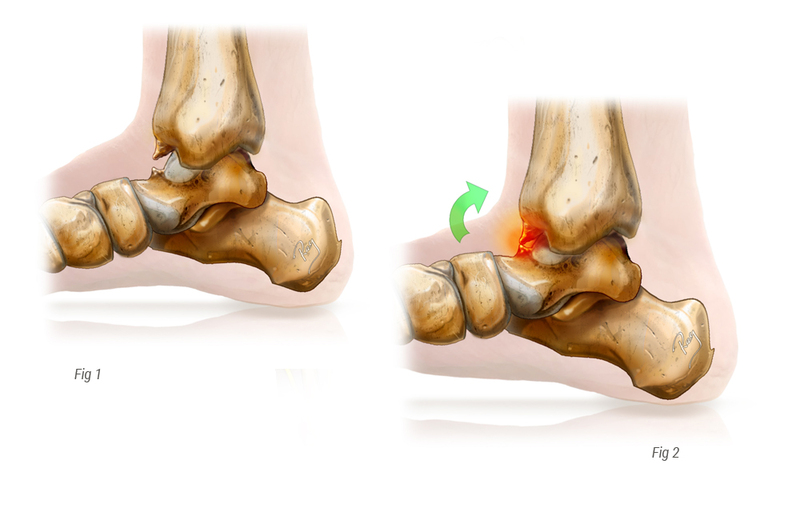 Distended, torn or broken, they can no longer play their role and make the ankle unstable or painful chronically . It is important to train the muscles of your ankle well and perform regular balance exercises (proprioception) to reduce the risk of sprains or ankle pain. Also make sure of the maintenance and choice of your football boots see the addition of custom soles. This is a common question and concern for footballers, professionals or amateurs. Unlike other joints such as the hip or knee, ankle osteoarthritis is usually post-traumatic, that is, osteoarthritis develops in the aftermath of a major ankle injury, even an old one. 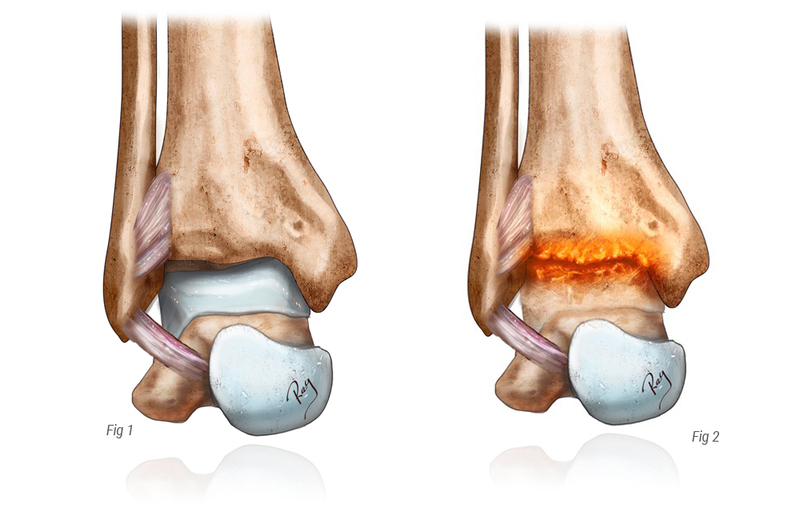 Classically, an ankle, astragalus or tibia fracture is found in the history of patients with osteoarthritis. It has never been proven that hyper-use of the ankle, as for example in an elite athlete, was itself a source of osteoarthritis. It is obvious that the more an injured joint is used, the faster the damage is, but it is then necessary to present an underlying pathology. It is known, however, that ankle instability is a common source of osteoarthritis. This particularity is often overlooked and neglected, but it seems very important to us to be aware of the subject.More than 80% of unstable ankles will develop osteoarthritis to a greater or lesser degree! It is therefore essential to follow optimal rehabilitation after a sprain, because many instabilities are due to insufficient treatment after the trauma. In the most advanced cases, it is sometimes necessary to resort to surgical stabilization which resolves the problem of instability and pain in the ankle permanently. The tackles, best friends of a good defense in bottom of ground, are probably the worst enemies of the bone integrity of the footballer! The load, on a limb blocked on the ground by the crampons, leads to sometimes severe fractures and we all remember these impressive images of fractures during televised matches. The most common bones are the tibia, fibula and metatarsals, but there is a long list of possible fractures. Remember if pain related to sports trauma struggling to decrease. There is, of course, no real way to protect you from this type of trauma because it is usually the opponent who causes the injury. Nevertheless, be careful and remember that a fall is often much less damaging than a tackle on a blocked leg. If you have been victim of such a trauma and have trouble getting in because of pain in your ankle. It is very likely that you suffer from a fracture. In this case, go to an emergency department for X-rays and a specialized examination.